The following are reports, insights and photos by volunteer writers about the historic April 10 National Day of Action for Immigration Justice. In Phoenix, as many as 300,000 immigrants and their supporters marched on the state capitol building sending the Legislature scurrying. The ultra-right wing legislative leaders, who are busily generating dozens of anti-immigrant bills, closed down rather than face the wrath of their constituents. In Tucson, upwards of 15,000 people marched from St. John’s Church to Armory Park to demand dignity for immigrants. “No More Deaths” was a prominent slogan in this city which has witnessed hundreds of deaths in the nearby desert every summer. Both the Phoenix and Tucson marches were each city’s, by far, largest political demonstrations ever. It was an awesome day. In Indiana, the undercurrent of immigrant working class struggle broke through the false calm of Midwest conservatism today. Chanting “Si, se puede!”, “We are good people; we are not criminals,” and “The people united can never be defeated,” 25,000 people flooded downtown Indianapolis in support of “Continuing the Dream: We Are All Immigrants”. This was the largest march in Indianapolis in over a decade. At the same time, over 5,000 people turned out in the smaller city of South Bend, three hours to the north, in support of the same causes. 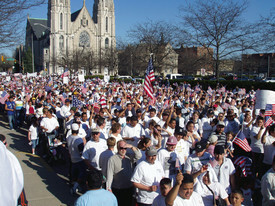 Organized by ACCION LATINA and the Central Indiana Justice for Immigrants Coalition, they and many other organizations were represented in the crowd of Indianapolis marchers. The Carpenters Union Indiana-Kentucky Region, Jobs with Justice, Justice for Janitors, the Mexican-American Civic Alliance, United Food and Commercial Workers, the Young Communist League, and more were on the streets today! Democratic Mayor Bart Peterson issued a statement supporting the march. Some public employees at the City-County building were reportedly allowed to leave early and some restaurants and cleaning services gave employees time off to join the demonstration. In Indianapolis, babies were being pushed in strollers in the warm, sunny afternoon, perfect marching weather. Dancers and disabled people in wheelchairs were among the slowly moving orderly crowd of Latino, Black, and white people, union members, other workers, mothers and fathers, grandparents and children. Among the slogans displayed on shirts was one that read: “No somos criminales. Somos humanos!” (“We are not criminals. We are people.”) The march was a celebration of the right of each of us to be treated as a human. This right to be treated as a human being is what HR 4437, introduced by Rep. James Sensenbrenner (R.-Wisc. ), aims to remove. This bill proposes to make it a felony for any undocumented worker to live in the United States, and for anyone to help or provide a service to them, be it religious, medical, humanitarian, or educational. It has already passed in the House. It remains to seen whether the Senate will enact this travesty of justice into law. The march lasted three hours during the height of rush hour traffic and culminated in a rally on the southern plaza of the City-County Building. Children wore shirts that said, “I love school” handwritten in black ink as they marched hand-in-hand with their parents knowing, too, that their future is at stake. Immigrant families, largely from Latin America, poured onto the Green in New Haven and marched on the State Capitol in Hartford Monday for two historic rallies in the national day of action for immigrant rights. Organized through churches, social clubs and word of mouth, each rally attracted over 2,000 participants carrying American flags and posters calling for equal rights for all and amnesty. Diverse speakers reflected a broad array of support from elected officials, unions, civil rights, civil liberties and peace organizations such as the Connecticut AFL-CIO, SEIU 32 BJ, Connecticut ACLU, state representatives, the mayor and members of the Board of Aldermen of New Haven, and Community Organized for Responsible Development. “We want reforms so that people can obtain legal status, be treated properly, be reunited with their families,” said Bishop Peter Rosazza whose parents were immigrants from Italy. Other speakers issued passionate calls for unity of working people of all races and nationalities for basic human rights. “Si Se, Puede,” chanted the crowd as they enjoyed the music of Mariachi Emperadores and the rock band Latin-Ka. A group of hunger strikers completed their 24-hour fast at midnight on the New Haven Green, while beginning preparations for the next rally on May 1st to keep the pressure on Congress to reject HR 4437 and enact a path to citizenship, worker rights and due process. SAN DIEGO: Displaying the flags of perhaps a dozen countries, 100,000 people in San Diego marched for human rights. Organized by a coalition of labor, religious and community groups the marchers were protesting the most recent right-wing legislative attacks on workers. Included in their grievances were the anti immigrant legislation, cultural demonization of undocumented workers, racist attacks by right wing paramilitaries like the minutemen, and the thousands of unnecessary deaths of people trying to cross the border. Entire families and, in fact, entire generations were represented amongst the marchers. Babies in strollers, high school and college students, workers, young old and retired, waved banners, homemade signs, played music and danced in what was the largest and most peaceful demonstration in recent San Diego history. Most prominent in the rally was the voice and vision of the local labor movement who went all-out to make this demonstration a success. A diverse group of active clergy and laity were also present to make known their willingness to violate any law that made it a crime to assist immigrant peoples. In a conservative military community like San Diego a mass showing of this type forecasts the people’s fight back that will display itself in the upcoming election cycle and in elections to come. Not only in San Diego but in the rest of country. SAN JOSE: Cesar Chavez is proud at this moment. More than 30,000 participants in his own town – women, men, children, and babies in strollers; families marching for justice. As I approach King and Story, my heart begins racing with anticipation and pride as I see a multitude uniting together for a common cause. The power of this picture overwhelms me. I honk and motion to my comadre following behind me. The energy sends me into a honking frenzy. Usually a crowd such as this is cause for speculation. But not today. Today we march together in peace and with pride. The streets are lined all the way to City Hall with groups of people in white T-shirts waving various flags as they wait to join the march. The column of marchers is long, but so is our struggle. We march in solidarity. The City certainly feels our presence. It is a good day to be Latino. “Si, se puede!” was personified today. Congresswoman Zoe Lofgren send a message of support urging opposition to HR 4437, and Assemblywoman Sally Lieber was present to express her solidarity. Though the crowd listened as respectfully as possible to their supporters, today they were not here to listen, so much as to be heard. The Dallas Immigrants Rights march, part of a nationwide series of more than 100 events responding to congressional anti-worker proposals, drew a crowd that doubled the highest previous estimate: 500,000. Although the commercial media made sure to publicize the views of counter-demonstrators, there weren’t more than a dozen of them. Through the long march and rally, the hundreds of police found no reason to arrest anybody. The town was shut down. Students turned out for that Sunday march, and they brought their whole families. One especially noteworthy development was a press conference held by popular State Senator Royce Williams and other African-American political figures. They called for African Americans to join the march. Jobs with Justice, a labor-associated coalition, asked union activists to join.